First, forget any old school kitchen design advice, about how everything must match. 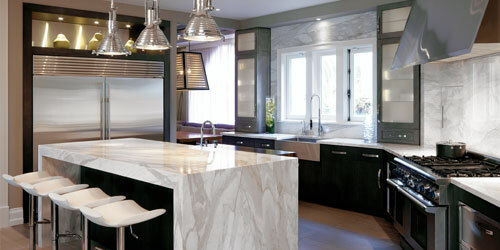 Countertop materials today can be radically different – granite on countertops and quartz or wood on the island. Cabinets can mix dark wood on one side of the room with light or painted wood on the other, too. Lighted display niches above the cabinets can solve the problem of shelves that are too high to reach. And color can pump up an all-white kitchen from blah to ahh. The trends also include eco-friendly cabinets, separate refrigerators and freezers, under-mounted sinks to prevent mold buildup, clean lines without fancy carved details and drawers for microwaves and refrigerators. Come see what designers have created in these four South Florida homes, by not following the old school rules. Backstory: Susan Rocco worked with interior designer Robert Zemnickis of Nuhouse Furniture + Design to remodel a 512-square-foot kitchen with a butler’s pantry on Las Olas Isles in Fort Lauderdale. The owners, who have teenaged children, wanted the space to be functional for cooking and entertaining but they also needed a desk. Everything was new except for their 48-inch gas range. Trends: The “fusion design” mixes transitional in the cabinets with clean contemporary lines on the Parsons style island, bar stools, pendant lamps and stainless steel front on the farmhouse sink. Dark cabinets contrast with the white Calcutta marble on the island and frosted-glass cabinet fronts. The biggest trend is clean lines. Gray is here to stay, too. Details: Hidden sliding doors were cut into the marble on either side of the range. When they are opened, LED lights make the spices easy to find. Frosted Plexiglas cabinet doors have LED lighting. Added appliances include a Sub-Zero refrigerator and freezer, a Wolf convection oven and a microwave speed oven. Refrigerator drawers are near the desk to store the children’s drinks and snacks. Backstory: This original kitchen in Davie had a small island and a peninsula counter. One of the owners, a cook and baker, asked for a larger island. She wanted the light cabinets replaced with darker wood. Trends: Dark cabinetry is broken up with a custom colored island. The countertop is Vetrazzo, a non-porous product made of recycled glass that is easier to maintain than granite. The green horizontal glass tile backsplash is one of the hottest trends. Details: The Sub-Zero refrigerator-freezer is integrated behind cabinetry. The other appliances are all Viking, including a fast-heating induction cooktop. Maple cabinetry from Holiday is eco-friendly with no added formaldehyde. Backstory: The snowbird clients asked for a high-end kitchen with user-friendly details, such as drawers organized inside for dishes and silverware, in their oceanfront Delray Beach home. They also wanted glass fronts so they could use them to display items. The dining and kitchen area are 500 square feet with a 5-foot deep island. Trends: Granite, which is no longer the preferred choice for many these days, was passed over for white Caesarstone quartz on the counters and wood on the island. More designers are using lighted drywall boxes like these on top of cabinets because top shelves have been difficult to reach in homes with high ceilings. Details: Renfro has added spice to the classic all-white kitchen with a splash of contrasting color. He painted the inside of the drywall boxes coral and used dark wood inside the glass front cabinets, on the counter of the island, in a bar with wine cooler and on the deck chairs used at the bar. All appliances are Miele – wall ovens, induction cooktop, dishwasher and built-in coffee system. Backstory: Cousineau worked with designer Linda Gonzales in this Boca Raton spec house built by Wm. L. Construction for Highland Development. A walk-in pantry was removed and the kitchen was expanded 30 percent to 860 square feet including a breakfast room. Trends: The dark wood island contrasts with the white cabinetry around the perimeter. Glass front top cabinets are lighted and painted to pick up the granite countertop color. Cousineau says clients are looking for a cleaner design without fancy carved details. Large gooseneck faucets are also popular. Details: The island has a built-in sink and a niche for a removable cutting board. Appliances include an integrated Sub-Zero refrigerator and freezer, a Wolf gas range and two dishwashers, a built in coffee system and warming drawer from Miele. Bath & Kitchen Creations, 3850 NW Boca Raton Blvd., Suites 19-20-21, Boca Raton, 561-392-8281, bathandkitchen.com. Allied Kitchen & Bath, 616 W. Oakland Park Blvd., Fort Lauderdale, 954-564-1611, alliedkitchenandbath.com. Chad Renfro Design, 277 Royal Poinciana Way, Palm Beach, 561-655-2208, chadrefrodesign.com. The Kitchenworks, 1808 E. Sunrise Blvd., Fort Lauderdale, 954-764-1482, thekitchenworks.com.